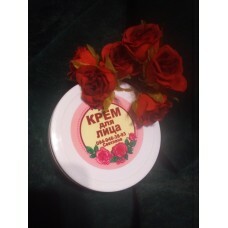 The natural face cream "anti-stress" is well perceived by the skin. This is a great advantage over an industrial cream that contains oil products and does great harm to the health of the skin of the face. Our cream has the richest composition of natural ingredients, which will help the skin to recover and rejuvenate. Only natural oils can provide quality skin care without harming the body. All over the world, home cosmetics are recognized as the best !!! Allantoin Allantoin has an antimicrobial and anti-inflammatory effect that promotes rapid and effective cure for a number of skin diseases. It effectively exfoliates the skin, which contributes to the thinning of the stratum corneum of the epidermis and its regular renewal. He also prevents the appearance of comedones and the clogging of pores with sebum. Allantoin is a valuable moisturizer for sensitive and problematic skin. Actively protects the skin from the effects of the environment. Allantoin has the ability to withstand free radicals, which justifies its introduction into anti-aging creams. It effectively cures irritation, softens, moisturizes and nourishes the skin. Aloe vera gel Aloe vera gel is recommended as a highly effective moisturizing, emollient, soothing. Essential oil of lemon Lemon oil relieves black spots, significantly softens the coarsened areas of the skin and exfoliates its dead cells, improves tone and improves complexion (especially spoiled by smoking or nervous overexertion). In addition, the substance is widely used for clarifying freckles and various pigment spots, bleaching the skin after an unsuccessful tan. In addition, it helps to make less visible the vascular network on the face (couperose). Hazelnut oil Vitamins, fatty acids and antioxidants in the composition of the hazelnut oil help to minimize manifestations of couperose, and with its regular use completely get rid of the red vascular reticulum and sprouts that form on the face in this pathology. Systematic application of hazelnut oil as a stand-alone product for application or a basic basis normalizes water-lipid metabolism, renews epidermal cells, which leads to improvement of skin color and condition. The product has perfectly proved itself, as an effective elixir from a fine set of wrinkles. Panthenol Panthenol is able to work miracles: it renews the skin, regenerates cells, produces anti-inflammatory effect, heals scars, wounds, smoothes scarami, gives skin radiance and sleek appearance. In addition, panthenol has a high penetrating ability, so it will "work" in deeper layers of the skin than other components of the cosmetic.